Additional staff members can register as an Industry Trade Show Delegate. 48 Anderson Hydra Platforms, Inc.
38 Coastal Construction Products, Inc.
43 Goodwyn, Mills & Cawood, Inc.
28 Gorrondona and Associates, Inc.
11 McKim and Creed, Inc.
61 Smith Seckman Reid, Inc.
33 Sweeping Corporation of America, Inc.
Single-day registrations are not available. Hotel accommodations are only available during the attendee registration process. 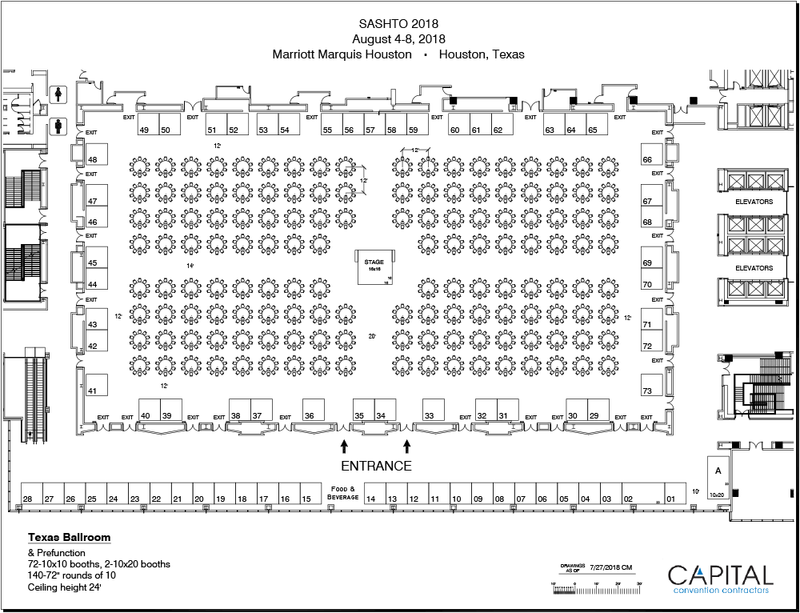 The host hotel will not accept call-in or online reservations from SASHTO attendees. Delegate registrants are limited to one (1) room per primary registrant and will be given the opportunity to request a specific room type (one king bed, two queen beds, suite, etc.) subject to availability during the registration process. The hotels require a deposit for each night(s) and will be charged to the credit card on file upon registration approval by SASHTO TX 2018.
Credit cards are the preferred method of payment for SASHTO TX 2018 and will be accepted during the registration process. Hotel accommodations, optional activities and the golf tournament all require a credit card during the registration process and will be charged immediately upon approval by SASHTO TX 2018 staff. All submitted delegates' registrations will be considered "Pending Approval" and will be approved in the order received. Registration numbers do not guarantee you will be approved and will not serve as final confirmation. Registrants are subject to an approval process to verify that each individual delegate has registered under the appropriate category. SASHTO TX 2018 staff will attempt to contact delegates who have registered in the wrong category with information they provided during registration to resolve any issues with the registrant prior to denying the registrant. Approved delegates will receive a final confirmation email. If paying by credit card, the credit card used during the registration process will be charged immediately and the delegate confirmation email will be issued.